To help Rachel reach her goal of participating in the 3 Day Journey benefiting the Susan G. Komen for the Cure and National Philanthropic Trust, I've donated four necklaces featured in Stringing Magazine to be auctioned off. Bid to SAVE LIVES! Bid to SUPPORT RESEARCH! Help FIGHT BREAST CANCER! "Treasure Net" originally appeared in the Spring 2007 issue of Stringing Magazine. "Inspired by the treasures found in the depths of the wine-dark sea, this funky and fun necklace showcases an eclectic mix of finds. Cast your own net and create a truly unique addition to any jewelry box." "Golden Secret" originally appeared in the Fall 2007 issue of Stringing Magazine. "What clandestine secret does this antique key unlock? Only the wearer of this gilt necklace - long and luscious - will know the answer." "Smile Rising" originally appeared online as a companion to the Spring 2007 issue of Stringing Magazine. 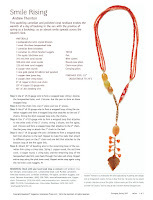 "This sparkling carnelian and polished coral necklace evokes the warmth of a day of basking in the sun with the promise of spring as a backdrop, as an almost-smile spreads across the wearer's face." "Child of Morning" originally appeared in the Fall 2007 issue of Stringing Magazine AND was featured ON THE COVER! "With luminous borosilicate glass, glittering faceted pearls and flashy rose gold leaves, rosy-fingered Dawn hangs with graceful movement and elegant sophistication. 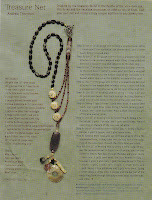 Wrap this lariat around your neck for a truly vogue and versatile piece!" I've posted a link from my blog to this post for you. Hope it helps! good luck & i hope you raise all the funds needed! posted to my blog toO!!! GREAT! Thanks you guys!!! You all ROCK! I really want to make this a success... and together, I know we can do it! Andrew - I've linked to your post. Very nice work. very nice work Andrew...here i have one option for you....Do online auction.